This rustic metal loop chain is perfect for hanging our star light fixtures, other hanging lights, metal shades and tin candle lanterns. 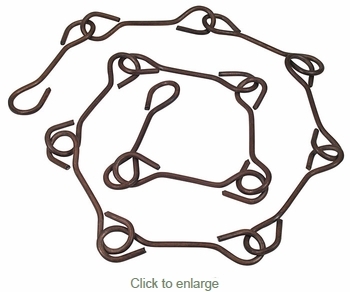 Chain is sold in 3 foot lengths: Chain links are easy to open with pliers to add or remove links to make desired length. Link Size: 2.5" x .75" • Chain Length: 3 ft.